A guide to how eggs are done right-and, more important, where. There seems to be some confusion among breakfast cooks and diners alike when it comes to the multitude of ways eggs are served. To alleviate this, we present a glossary of the preparations most often botched, and do it without even with only one use of the word eggsellent. Om•e•lette [AHM-uh-let] Eggs beaten with milk that follow the French tradition of being folded over any fillings (as opposed to the ingredients being mixed into the egg before cooking, which would make it a frittata). It’s crucial to lightly season with salt (pepper is optional but welcome), and any browning of the egg is unacceptable. For textbook examples, see Southport Grocery(3552 N Southport Ave, 773-665-0100, $9), which does a tasty arugula-apple-goat-cheese variety, and Lula Cafe(2537 N Kedzie Ave, 773-489-9554, $11), whose offerings change every other week or so but are always perfectly prepared. 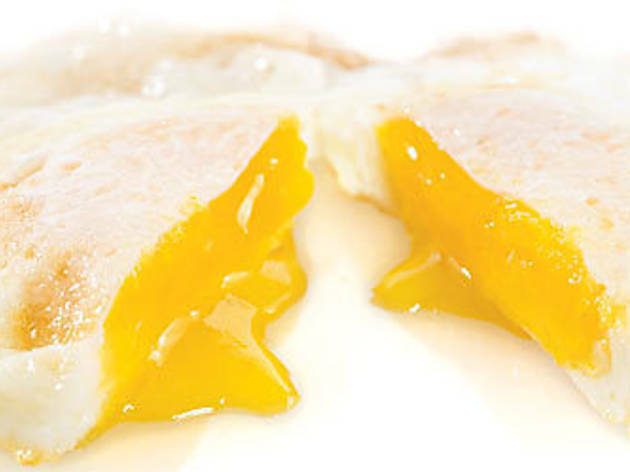 O•ver me•di•um [oh-ver MEE-dee-uhm] A whole egg fried in a pan, flipped once to cook both sides, and finished when the yolk is right in between runny and solidified (a texture best described as gelatinous). If the yolk oozes out when poked, it’s over easy. If the yolk side never actually touched the pan, it’s sunny-side up. 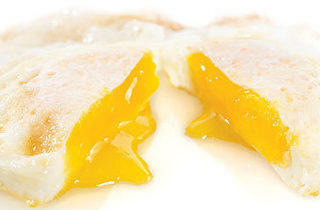 If the yolk is solid, light yellow and similar to the interior of a hard-boiled egg, it’s over well or over hard. About 99 percent of the over-medium eggs we ordered over the course of researching this article were served over easy, but three places nailed it: Orange(2413 N Clark St, 773-549-7833, $1.50), Melrose(3233 N Broadway, 773-327-2060, 95 cents) and Nookies Tree(3334 N Halsted St, 773-248-9888, 95 cents). Disclaimer: Because getting the perfect over-medium egg is reliant upon landing the right line cook, we won’t guarantee that our experiences can be replicated every visit. But being armed with the information is half the battle. Scram•bled [SCRAM-bulled] Whole eggs that are beaten (often with a touch of milk), lightly seasoned with salt and cooked slowly over medium-low heat. Orders can be specified for scrambled “wet” or “dry” (which is exactly as it sounds), but either way the final product should have no browning and no crispy edges and be comprised of nice, soft curds. The most common mistake we found was the omission of even a whisper of salt, followed by overcooking. For ideal versions, try Feed(2803 W Chicago Ave, 773-489-4600, $4.50) and Caffe de Luca(1721 N Damen Ave, 773-342-6000, $8).